Virginia, your mother tells me how your playground friends told you frightening tales about Harry Potter’s kraken monster when you mentioned the kraken fish you saw at the aquarium. You needn’t worry, dear. There’s no such thing as a kraken monster, and actually there’s no such thing as a kraken fish, either. There are kraken victims of a finned fish. These are candidates outside of the box containing the fin, which would be victims were the fin to be removed. They are removed anyway, because they “see” that fin. That’s not scary, is it? Remember our talk at the aquarium. “Seeing” is a way of saying that if the see’er is true, the seen must be false. Victims of regular fish are removed because, if true, they would see a postion along the fish lines that one of the lines must occupy. A fin provides an extra position on a fish line, relieving the shortage of positions and freeing all victims. But any victim that sees the fin is removed anyway. Were it true, the fin would be false and the fish would declare it false. So it is history, whether the fin is true or false. So the kraken fish eats candidates that see too much, not little girls like you. The obvious victims of a finned fish are the ones in the box with the fin. Call it the fin box. They quite obviously see the fin. But Virginia, as a sysudoku solver, you must search for kraken victims whenever you spot a finned fish, regardless of victims in the fin box, because there are many other ways for them to see the fin. The sysudoku clan calls this search kraken analysis. Uncle Andrew Stuart likes to call the removals by fin box vision filleting the fish. It’s removing the fin, isn’t it? By the same license, sysudokies like to speak of kraken analysis as “krakening” the finned fish. To illustrate, let’s look at a finned swordfish in uncle Andrew’s www.scanraid.com site of October 2009. 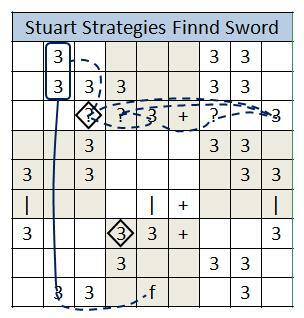 The Swordfish in columns 1, 5 and 9 is perfect, except for a fin in r9c5. A victim in the fin box is marked for removal. Now Virginia, see if Uncle Andrew’s finned swordfish has any kraken victims. 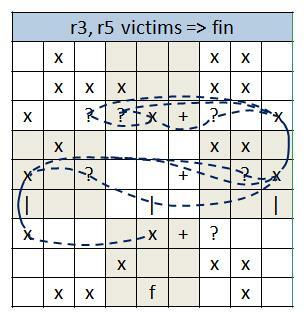 Tracing sight paths from the r3 and r5 victims to the fin, Virginia finds that all three force the fin true by removing the three other candidates from c5. Actually, Virginia sweeps candidates off from her ©PowerPoint copy, leaving the true ones, and makes me draw the curves. But Virginia lets out a little shriek as she sweeps off the fin on her copy testing r7c7. I’m proud how she navigated the forcing chain. A kraken victim by ER. Virginia is tucked into bed and seriously, I ask you. Does Stuart’s filleted finned swordfish now become a kraken fish? It still has a fin box victim. The fish is the same. I think “kraken” is best applied to the victims, and the technique of finding them, and like I told Virginia, kraken analysis is required for closure on every finned fish. Kraken victims are quite common, and the analysis is not as monstrous as all that. On this update I can say that all that will be confirmed in my review of Hodoku finned fish in December 2015. Reviewing this post for that effort, I found a new lesson among the sudowiki Strategies. 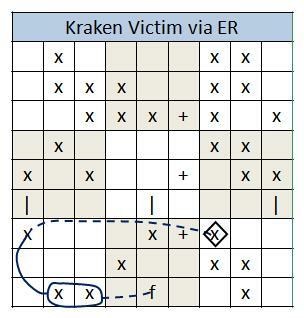 The example above is now modified to eliminate the kraken victim, only to encounter another, even more instructive one. Now the row 3 potential victims all confirm the fin by creating a 3-wing that eliminates the remaining 3 in c5, apparently rescaping the finned swordfish But alas, the one in r3c3 now sees the fin via grouped forcing chain, and is led off on another charge, forcing the fin to be both true and false. 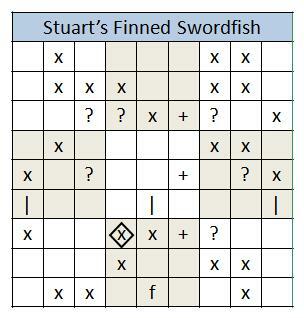 I don’t mind saying I was disappointed with the treatment of finned fish in The Logic of Sudoku, 2007 edition. Stuart has just finished a chapter on POM, the Pattern Overlay Method, when he comes to finned fish. He invokes POM analysis in a needlessly complicated rationale for the removal of box fin victims. And Andrew does it incorrectly, saying that a pattern containing the fin cannot contain the box fin victim, which is not saying anything. He would be nearly right in saying that the box fin victim is an orphan, belonging to no pattern. But alas, there is one. But worse still, Andrew did not include kraken analysis in his important book. Let’s hope it is added in the next edition. So let’s get kraken on the LA Times 5/14/10. If you continued line marking as if unaware of the skyscraper removal, a remote pair keeps r3c5 free of 5,7. There is the LA skyscraper and its victim. 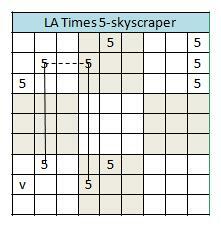 Of course, the skyscraper is a 3-link 5-chain, and the last Sashimi X-wing we saw was a 3-link X-chain. By definition, every Sashimi X-wing is a finned X-wing. Is it also a 3-link X-wing? To answer that question, we need to start with a representation of every Sashimi X-wing and prove that it is an X-chain. Let’s reserve that for next post, but with that in mind, can you find any Sashimi X-wings in the 5-panel? And in particular, can you find one that is also the skyscraper? And look at all the slinks in the 5-panel, and only two winks. What can you make of that? Next week, we sashay into Sashimi land. Or is it “shimmy into Sishami land”? This entry was posted in Advanced Solving, Expert Reviews, Stuart, Sudoku Toolware and tagged clueless wink, ER, finned fish, kraken fish, kraken victim, weak link. Bookmark the permalink. Charming website. Make sure you keep this superb work. Appraisal, where would you like to see the blog go, when all of the strategies out there have been explained and illustrated?